Air Experience Flying involves flights in the Grob Tutor dual controlled RAF training aircraft with cadets handling the controls in a progressive series of exercises. Under the guidance of a trained pilot, you will be able to take control of the aircraft yourself and even perform your own aerobatic manoeuvres. Opportunity flights, in other aircraft such as Chinooks and Hercules, also take place on R.A.F. Station visits and at annual camps. 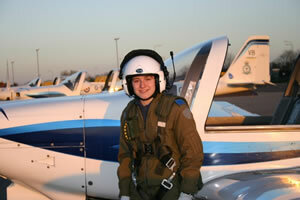 Some cadets will fly solo if they are awarded an RAF Flying Scholarship. From age 16 Glider training is available. Gliding scholarships, potentially culminating in solo flight, will be awarded to cadets who demonstrate to gliding course staff aptitude for further training and strong motivation to continue with flying training. The minimum age for Gliding Scholarship is 16. Those cadets who have achieved the required standard will be awarded blue wings and a certificate to show that they have successfully completed the course. Cadets showing the correct aptitude may be invited to continue to solo level. 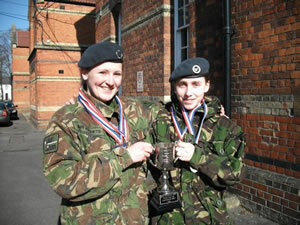 Cadets who go solo will be awarded silver wings and a certificate. 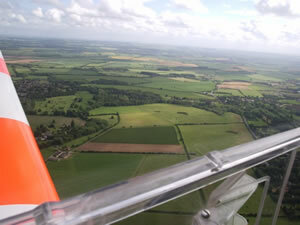 Gliding is yet another opportunity for you to develop your flying skills. Gliding is similar to powered flight except that a glider does not use an engine -- it instead uses thermals, pockets of rising air, to keep it in the air. The two most common types of Glider are the Viking and the Vigilant. We use the Vigilant glider which has an engine used to launch the aircraft which is then turned off once in flight. They are flown from VGS (Volunteer Gliding Schools) across the country. The Air Cadets also offers rifle training. The two rifles currently in use by the Air Training Corps are the No.8 .22 calibre and the L-98. Cadets learn to fire the No.8 as part of their first class training syllabus and progress to the L98 rifle after the age of 15. To be able to fire any weapon in the ATC you must first undergo an extensive training course and then must demonstrate your learning through a written and a practical test before being authorized to fire the weapon. Once this is done, a trained weapons instructor will sign your 3822 (Cadet’s Record of Service Book) certifying this fact. Weapon Handling Tests then have to be completed every 6 months to ensure you stay safe and knowledgeable. 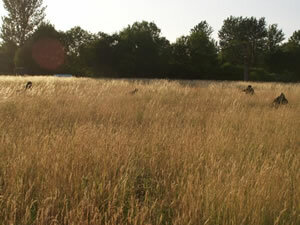 Shooting is carried out in a controlled area known as a range. These ranges come in many sizes (e.g. 25m or 100m) and can be placed indoors or outdoors. 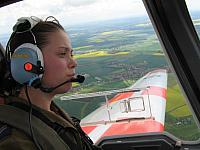 Many Squadrons have their own range to allow cadets to get as much practice as possible. As with any ATC activity, safety is the most important consideration. Full training is given to all cadets before they are allowed to fire any weapon and staff will ensure that the cadet has the mental maturity to handle such a weapon. Shooting is supervised by trained and responsible adult personnel, who are fully equipped to deal with any eventuality and ensure that the range is operated safely and efficiently. To achieve the Squadron Marksman you must achieve a score of 75 out of 100. You will shoot 5 rounds at the target. The process is repeated 4 times to create the maximum score of 100. Adventurous activities (including orienteering, climbing, hill-walking and expeditions) are arranged by staff on a regular basis. The ATC provides numerous residential courses and insists on the highest supervisory standards. The Duke of Edinburgh’s Award is a voluntary, non-competitive programme of practical, cultural and adventurous activities, designed to support the personal and social development of young people aged 14-25, regardless of gender, background or ability. It offers individual challenge and encourages young people to undertake exciting, constructive, challenging and enjoyable activities in their free time. The scheme started in 1956 and its founder and Patron is HRH The Duke of Edinburgh. The Air Training Corps is the largest operator of the Duke of Edinburgh's Award scheme in the country with about 3000 Air Cadets gaining their Bronze, Silver and Gold Duke of Edinburgh's Award each year. We are currently participating in the Duke of Edinburgh's Award Scheme and through us cadets are working towards their Bronze, Silver and Gold awards. Basic Self Defence is taught by WO Seb Miller, a member of the Self Defence Federation and an experienced Martial Artist. The techniques that are shown and practiced are all stripped-down from Judo, Karate, Wu Shu, Kendo, Aikido, Krav Maga and even military ‘dirty tricks’. The on-going training is aimed at cadets in the school and or public environment and focuses on giving back the cadet’s self-confidence and an ability to cope with an escalating situation. Armour and other protective gear is provided and full careful instruction is always available. 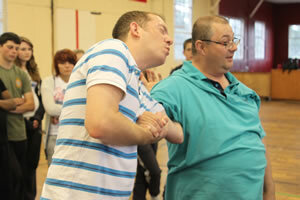 1996 (Earley) Squadron is the only Squadron with a member of staff qualified to teach Self Defence. 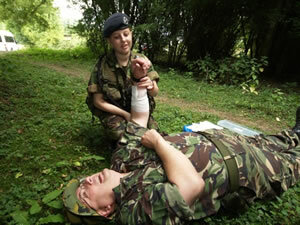 All Air Cadets are taught first aid, covering Unconscious Casualties, CPR, Heart Attacks and Choking & Bleeding, under the HeartStart initiative. 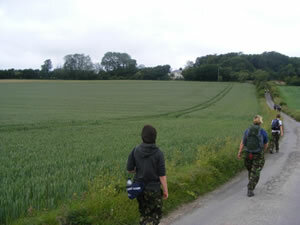 Air Cadets undertake Ground Defence Training throughout the year. This training will give you the skills to be able to participate in Night Exercises both on and off Squadron. Tactical Leadership Courses are run several times a year at Bramley Training Area to put what you have learnt into practice. All Air Cadet units practice drill to aid discipline and develop teamwork within the unit. While at the Squadron, drill develops a sense of corporate pride, alertness and precision, while being smart and giving cadets pride in themselves. 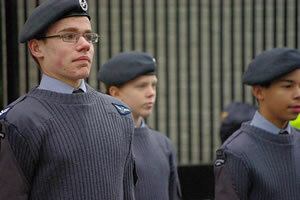 Squadron drill prepares cadets for bigger formal parades, whether on camp, a formal parade or marching through a town. For big events cadets will practice ceremonial drill, which could include you being a Banner Bearer. Once a cadet reaches the rank of NCO (Non-Commissioned Officer) they will be encouraged to take control of a squadron. As an NCO progresses through the ranks, he or she will then pass on their knowledge to the new NCOs below them.